Our Lady & St. Peter. © Adrian Cable 2015 and licensed for reuse under a Creative Commons Licence. 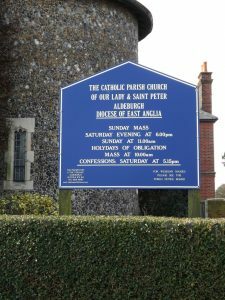 A Catholic Parish was first established in Aldeburgh by the Ursuline Nuns who arrived in 1904. 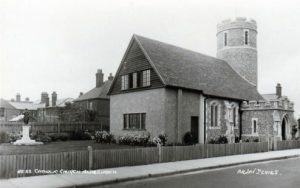 The first portion of the current church building, comprising nave (part), tower and principal porch, was officially opened on 25 March 1925 by the Bishop of Northampton – see 1925: The new church at Aldeburgh. The Mayor of Aldeburgh was present. The parish priest at that time was Father C. M. Davidson. The architect was Mr. Young who sadly died before the church was opened. Provision was made for later additions, such as extension of the nave, erection of a sanctuary and inclusion of two side aisles forming side chapels. 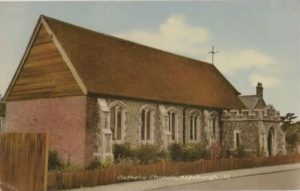 The church was later extended (date to be established). During World War 2, the tower suffered bomb damage and it was reduced in height. The parish has since been extended to include All Saints, Leiston. His lordship the Bishop of Northampton visited Aldeburgh-on-Sea, Suffolk, on Wednesday of last week to perform the ceremony of opening the completed portion of the new church, dedicated to Our Lady and St. Peter. An illustration of the exterior of this building, showing the round Suffolk tower, which is one of the characteristic features, appeared in The Tablet for August 9 last year (page 596). 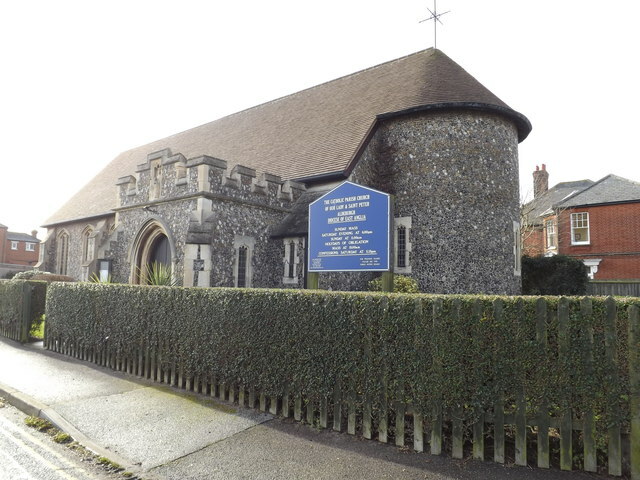 Aldeburgh was established as an outpost of the faith more than twenty years ago, when a community of Ursuline nuns from France opened a convent in 1904. With their return to that country the need for a church became imperative, and it was with great joy that Catholics from the surrounding districts, with contingents from Ipswich, Woodbridge, and Southwold, assembled last week for the opening ceremony. The blessing of the church had been performed on the previous evening, the 24th, by the parish priest, Father C. M. Davidson, D.D., and the Bishop celebrated the first Mass the next morning. At eleven o’clock solemn High Mass was sung by Father Davidson, assisted by Fathers E. Stokes and E. McHugh as deacon and subdeacon. His lordship the Bishop was assisted by Mgr. Freeland, V.G., and Canon Peacock, of Ipswich. Father Marshall, of Cambridge, acted as M.C., and Mgr. Barton Brown was in the sanctuary, with Fathers St. Leger Mason (Southwold), Donovan (Stowmarket), Shebbeare (Woodbridge), McCaul (Ipswich), and Fitzgerald (Thetford). The Mayor of Aldeburgh was also present. The sermon was preached by Father Hugh Pope, O.P., on Christ and His Church, eloquently and touchingly bringing home to all present the work of Our Lord in the sacraments, and particularly by His Sacramental Presence on the altar of every Catholic church. Mr. Albert Groves, with boys from St. Michael’s School, Hitchin, was responsible for the singing, and Hasler’s Dixit Maria Mass was effectively rendered. Mr. Groves kindly volunteered his services, and at a recital the previous evening showed once again his skill as a choirmaster. After the High Mass a luncheon was given at the Brudenell Hotel. His lordship the Bishop in his speech said it was a special joy to him to be present, as that was the first church he had opened as Bishop of the diocese. It was also a joy to him to announce that he was the bearer of the Holy Father’s blessing to the Catholics of Aldeburgh and the district. He felt he must congratulate the town upon the acquisition of such a beautiful church. All must feel great sorrow at the death of Mr. Young, the architect, but he must felicitate Mr. Reid, his partner, on the great success of the building ; Mr. Redde, the builder ; the workmen, the benefactors, and Father Davidson. Undoubtedly the building was a little gem. Father Davidson, responding, thanked his lordship for having made a special effort to be present and for his continuous encouragement and help through difficult times. He hoped that something really permanent had now been erected, the round tower and the dedication to Our Lady and St. Peter recalling the ancient churches of East Anglia, once so faithful to the old religion. He would like to thank first the Ursuline nuns who first made possible the establishment of a Catholic parish, the anonymous donor of £1,000, Mrs. Eyre for many gifts, the many benefactors, the Mayor for his presence, and the town for its good will. The expenditure incurred has amounted to £2,300, of which £500 has been borrowed. After the luncheon there was Benediction and Te Deum, when again the church was crowded to its utmost capacity. Part of the nave, the tower, and principal porch have now been erected, while provision is made for subsequent additions which include extension of the nave, erection of sanctuary, and the completion of two aisles forming side chapels. The architecture is fourteenth-century Gothic. Flint has been used in the facings of the walls, and Monks Park stone has been worked for the mullioned and traceried windows. A striking feature is the round tower, and its attractiveness is enhanced by its commanding position over the town steps. The roof of the church is covered in with antique red tiling, while the moulding of the porch ceiling is picked out in red. The beautiful reredos at the back of the altar, designed by the late Mr. Arthur Young shortly before his death, is at present unfinished. This reredos is intended ultimately for the Lady altar at the other end of the church when completed.